The first Saturday back after the half term break is always a tough one for Habs and this proved to be no exception. 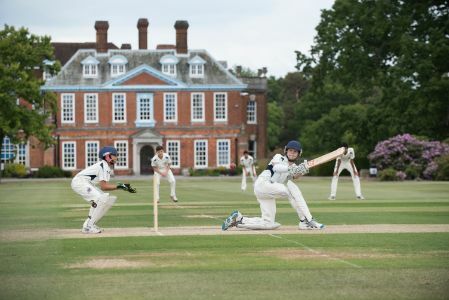 As usual, Berkhamsted provided strong opposition and, although our junior cricketers enjoyed plenty of success, we struggled at the senior end and lost the block fixture overall by seven games to six. In the top game, the Berkhamsted captain had no hesitation in opting to bat after winning the toss, a decision which was immediately vindicated as he and his opening partner put on 176 for the first wicket. Off-spinner Saavan Shah bowled well in the circumstances, conceding just 38 runs from his 10 overs, but the other Habs bowlers all struggled as our visitors posted a formidable 268 for 4 in their 50 overs. In reply, our batsmen went for their shots from the start, throwing caution to the wind, a policy which failed badly as we collapsed to 53 for 5 in the 11th over. When the 6th wicket fell with the score on 91 all seemed lost, but a superb 125 run partnership for the 7th wicket between Luca Ignatius (86) and Shah (60) gave us renewed hope. Unfortunately, it was not quite enough. Both batsmen perished trying to hit boundaries and in the end we were dismissed for 246, 23 runs short of our target.